All LANTANA RIDGE homes currently listed for sale in Spring Branch as of 04/18/2019 are shown below. You can change the search criteria at any time by pressing the 'Change Search' button below. "Beautiful custom home almost completed. Spacious open floor plan. State of the art construction by reputable builder in the area. Fenced in back yard, freshly sodded and irrigation system. Large back patio, great for entertaining. Concrete drive to a three car garage. Standing Seam metal roof. Spray foam insulation. Large master bedroom, bath and closet. Two to three weeks from completion. Come check it out." "Looking for a Stunning home. This is your home! Energy efficient unlike any other. State of the art equipment in this home so your energy bills are unbelievably low. Water Furnace, Geothermal heat pump, Solar Panels, Marathon water heater, spray foam insulation. Beautiful Open floor plan, gourmet kitchen with beautiful granite, decorate colors. Game room w/Wet bar is upstairs. Property is fenced. Shows Beautifully Meticulously maintained. Schedule your showing you will Love!" 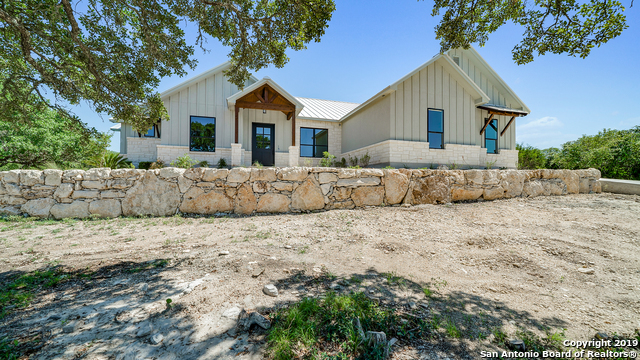 "Beautiful custom home in the Texas Hill Country. 4 bdrm., 2.5 bath home that sits on 1.34 acres in the gated Lantana Ridge Community. Stunning home with double front doors, soaring ceilings w/ custom ceiling treatments, large chef's kitchen w/ built-in appliances, granite island, and plantation shutters throughout. Spacious master bedroom w/ access to the back yard. Large master bathroom with raised tub, large shower, and walk-in closet. Beautiful backyard with pool, sauna, oversized covered p"
"No City Taxes, Under Construction, 2019 Completion. Open floor plan, 10'-13' high ceilings in master bedroom, kitchen and entry. 8' doors through out home. Solid surface countertops, quartz. Stainless Steel GE Profile appliances, pre-plumbed for gas grill at outdoor patio. Pre-plumbed for future water softener. Security system, underground utilities, 1 acre lot w/mature trees."